Over 40 guests visited Joliet Junior College to expand sustainability efforts in Will County on April 5. The Will County Regional Sustainability Network (WCRSN), a program of the South Metropolitan Higher Education Consortium (SMHEC), held the Greenest Region Compact: Stories in Will County. The event was hosted by the SMHEC Member Institution and JJC. 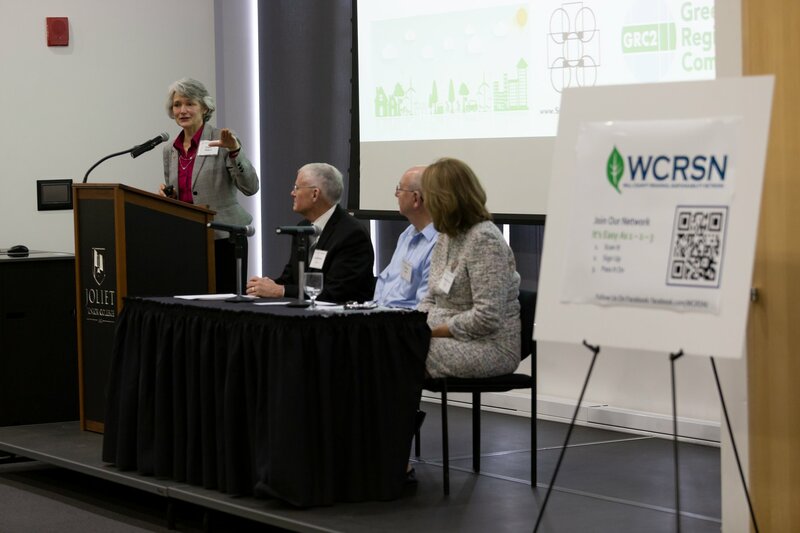 Edith Makra, director of environmental initiatives for the Metropolitan Mayors Caucus, stated she admired the “impressive display of sustainability innovation from Frankfort, Diamond and Homer Glen,” while moderating a panel of civic leaders at the event. “Your leadership on the Greenest Region Compact will help your peer communities relate and see the value in it,” said Makra. The morning began with Dr. Judy Mitchell, JJC president, who in her opening remarks discussed the importance of cross-community collaboration. She reminded the audience of her commitment, along with regional partners Dr. David Livingston of Lewis University and Dr. Arvid Johnson of the University of St. Francis, to sustainability and the communities they serve. All three signed the Will County Regional Sustainability Network Compact last year. “It is our formal commitment to link and align existing sustainability efforts in and around the Will County region, to build and leverage relationships between all stakeholders, and to establish an infrastructure to support the activities of the network,” Mitchell said. She went on to highlight recent sustainability successes at JJC. Mitchell noted these choices and investments are made because JJC believes in the importance of this work. Dr. Mitchell introduced Makra, who discussed the Greenest Region Compact (GRC) and its impact on Will County. Following her keynote presentation, Makra facilitated a panel of local civic leaders. It included Mayor Teresa Kernc of the village of Diamond, Mayor Jim Holland of Frankfort and Randy Juras, a member of the Homer Glen Environmental Commission. Together, they shared their community success stories as a result of adopting the GRC. The morning continued with a workshop style session as attendees broke into small groups to dissect the GRC framework and network with their peers. Before breaking for the day, 13 communities were recognized for their formal adoption of the Greenest Region Compact in a small award ceremony. The event was sponsored by ComEd, Constellation, Nania Energy, Inc, and Wight & Company. The South Metropolitan Higher Education Consortium (SMHEC) is a unique partnership between two-year and four-year, public, private and for-profit higher education institutions in the south metropolitan area. It extends south from the city of Chicago to the western border of Joliet, the southern border of Kankakee and east to the Illinois-Indiana state line. The mission of the consortium is for its members to collaborate to enhance educational services and programs in the region. In 2014, SMHEC launched a regional effort to link and leverage community resources to make the Chicago southland the “greenest region.” Communities within SMHEC’s boundaries began meeting regularly to share success, identify areas of opportunities and leverage resources. In 2016, key stakeholders made the decision to create three distinct sub-regions, identified through community college boundaries, to begin and expand sustainability efforts and thus the Will County Regional Sustainability Network was created. Through these groups, this event and many other initiatives, have been launched. For more information about SMHEC or Link and Leverage, please contact Allessandra Kummelehne at akummelehne@prairiestate.edu. For media inquiries on sustainability efforts at Joliet Junior College, contact JJC Communications and Media Coordinator Scott Harvey at 815-280-2844 or sharvey@jjc.edu.